Who say’s you “have” to hand out Halloween Candy this weekend? I will be the first to admit that I have a sweet tooth but, if I am really honest with myself, I don’t need the extra temptation and my kids sure don’t need the sugar rush. And let’s face it…bags of candy aren’t exactly cheap either. You can skip the sweets and still be the coolest house on the street. 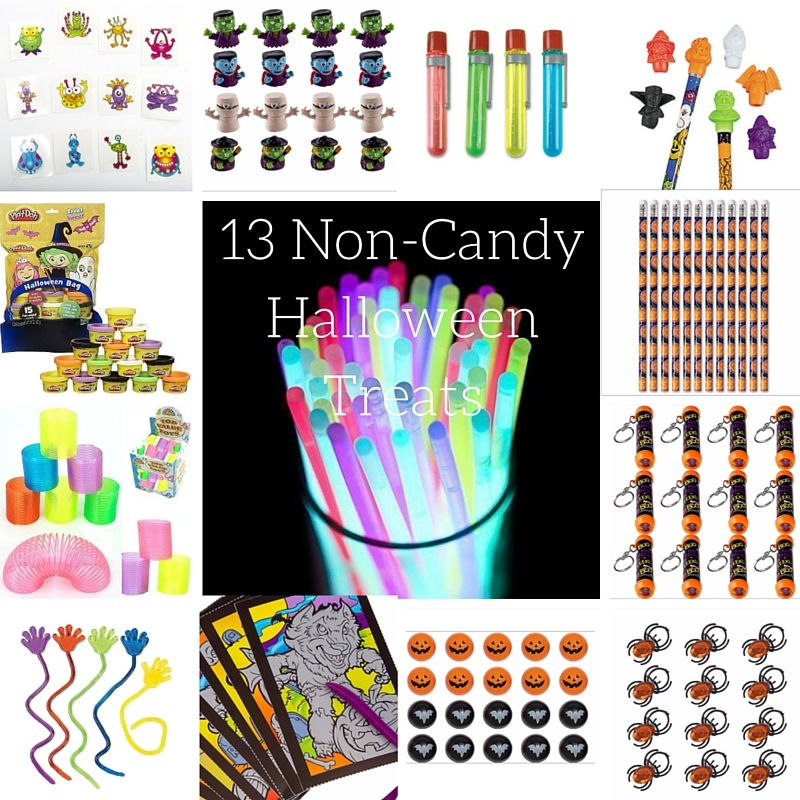 I have compiled a list of 13 non candy Halloween treats that won’t break the bank or get your house egged. All of the links are clickable so you can get your order delivered before those first little trick-or-treaters are ringing your doorbell. Trust me kids will be getting PLENTY of candy this month regardless so, I know these 13 non candy halloween treats will be a favourite! What non-candy Halloween treat is your favourite and what would you add to the list? What will trick or treaters find at your house this year? Great ideas. I love the glow sticks! These are such great alternatives to candy! I feel like Glow Sticks are always a hit with the kids no matter what the age! I remember getting non-candy treats when I was a kid. They were much more special to me then the candy. Monster tattoos. Those would be fun to pass out and I know the kids would love em. It is good to have an option to give children something other than candy.. It makes it easier to give something to children with food allergies. We love the play doh idea. My pre-schooler just loves play doh and tbh I prefer anything that isn’t candy in my house too. These 13 non-candy halloween treats look fun and awesome! I will keep it in mind for trick or treaters this year. The less cavities the better! Oh these are brilliant ideas. I’d love to offer some of these this Halloween! What a great idea! Seriously, kids get enough candy! These are really cute alternatives. The monster tattoos would be a big hit with my little cousins. They can enjoy them way past Halloween. I love this idea – my girls actually LIKE to get prizes over candy when trick or treating! I always thought this would be a more expensive route to take – but I see that it is not. These are all such cute idea, I bought candy and I wish I wouldn’t have. We haven’t picked up anything yet so I am hitting up the dollar store for some non-candy ideas. I just wish I could find a teal pail!! I love these ideas. The candy can be a big problem for many kids, and it’s also so repetitive and my kids can never eat all that they get. It’s nice to think of alternatives. This is a good list for school parties since we can no longer bring treats. I’m a glow stick fan all the way! 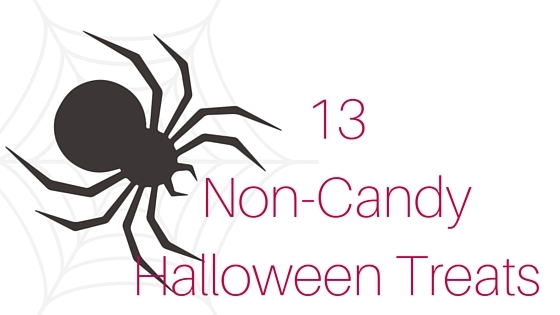 I like the idea of non candy treats. Not all kids are allowed to have candy so this is a perfect compromise. I love the idea of handing out glowsticks since Halloween is the perfect night to use them. Always nice to hand out something besides candy! I handed out goody bags one year. That was fun! My kids get enough sugar as it is, so I LOVE the idea of non-sugary treats! Great ideas.